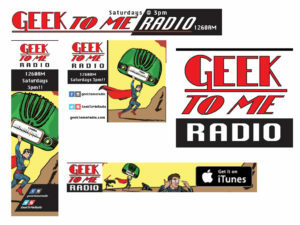 Riffing on steadfast, well-known pop culture such as sci-fi and fantasy, Geek to Me Radio needed a comic book style identity to advertise itself. True that says blog, but he mostly does live video, radio/podcast broadcasts. One of my favorites is the 15 second comic review. It’s hilariously fast. 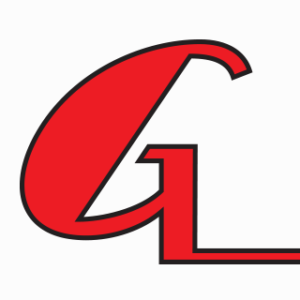 The client is a conscientious sort, and was worried about copyright violations and such regarding his ideas. Since we kept the artwork as a tribute to the cover, it hasn’t been a problem. The cover of the original has become iconic, and contemporizing it would be a fun honor. The client wanted to pay tribute to the classic Action Comics #1 cover which debuted Superman. After conferring with him in what I call a discovery meeting, he had a pretty clear direction. I was to pay tribute to the Action Comics issue by emulating it, and replacing the existing characters with the 10th Doctor Who, Darth Vader, and Super Mario. The client’s profile would replace Superman’s as well. In addition, the car from the original cover would be replaced by an older radio. 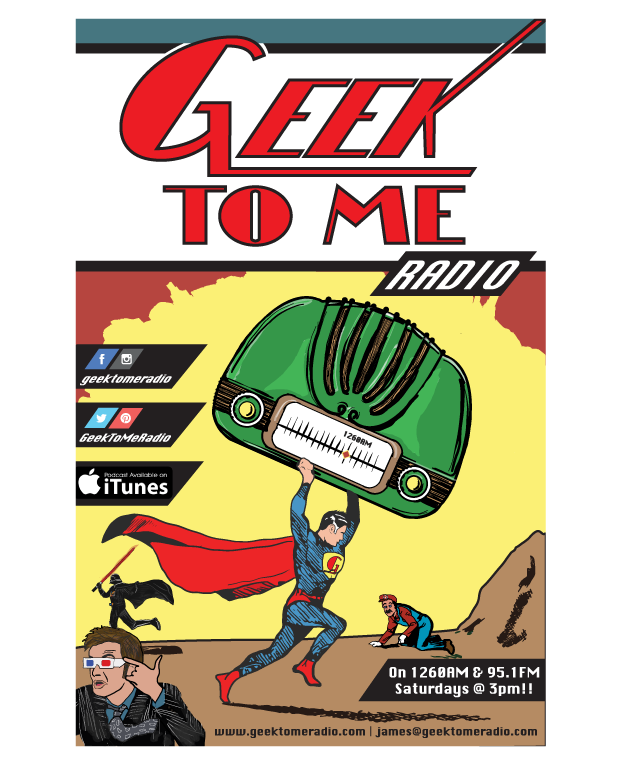 Subtle details like replacing the Superman ‘S’ with a ‘G’ (for Geek), and actually moving the dial of the rendered radio to the actual station location were minor tweaks I also added. 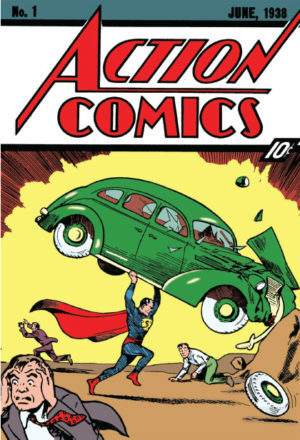 Original Action Comics #1 cover: The debut of Superman. This was the first freelance project I got to employ true cross-device functions of my laptop and tablet. Through the Adobe Creative Cloud apps, I had great fun and serious dedication to hand drawing each character on my tablet and then transferring them to Illustrator or Photoshop Proper. I have to say, Adobe has done this really well, and I can’t wait to upgrade to an iPad Pro and Apple Pencil. My Adonit is nice, but there’s serious lag that leads to time lost and frustrations. Drawing digitally is a great labor of love currently, but I do enjoy it. I was fascinated how easy it went, and found I could concentrate on other elements that paid tribute more deeply to the cover. Panicking 10th Doctor and scared, flamboyant Darth Vader. Most importantly, a new letterform/font style would be generated based on the Action Comics title. there were a few options in existence, but tenacious as I am, I created newer forms from scratch. Simpler, detail/informational lettering would be handled by a unique, but universally attainable font. A few tweaks to letter spacing, and this was easily made more enticing. I have to say, creating the ‘G’ was the most intriguing. I wrestled with several variations of how to extend its tail like the ‘A’ of the original issue, and ultimately presented many to the client for feedback. We mutually agreed upon the existing one, and that was that. Other letters weren’t so hard as they already existed in the original version. The letterforms were easy enough to do in Illustrator proper with the constant tweaking of space, anchors, and such to get it *just* right. Reconstructing the background of the Action Comics issue was simple enough with larger shapes. The ‘Geek to Me’ title letterforms are strong, persistent and obvious as intended. Once all the elements were established, it was academic to combine them attractively based on the original source material. Working heavily in web design, as well as responsively in that capacity, it was easy to condense the information and artwork into various standard web ad formats. Social media icons can prove to be a bit more difficult, since it is such a new delivery platform. Facebook today largely not the same as Facebook a year or so ago, and only Facebook knows what direction they’ll do next. that being said, it wasn’t all that difficult. The poster and business cards are the true triumph because it gives all the elements a chance to breath, work on their own, as well as cooperate with each other—even if they are running away from each other in fear. 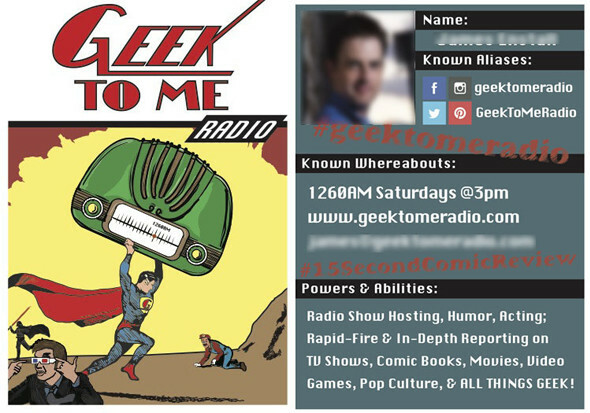 The final business card, color altered for matte printing as a ‘pulp’ style card. The back is based on old DC Who’s Who comics. At the end of the day, it is the client’s pleasure and pride that’s important with my aesthetic decisions, and I’m happy to report this client was (all of the are, really, but who’s counting?). The client has illicit new ideas as another ‘tribute’ poster coming up to newer seasons and giving homage to Marvel this time. it should be a fun time again.